This is a picture from the most current German Pokermagazine where we used to write a column. We have not written a column in the actual magazine because there have been issues. Bad issues. Such as editing our writings without double-chcking with us. Such as replacing images without our knowledge. Such as not paying our invoice. So, when we hesitated to supply our work for January they first offered us to have the column written by “ghost writers” which we declined. Then the talkings stopped. Now theres the magazine with a column, written only-god-knows-who those “unknown” authors are. Just thought to let you all know, thats not us. 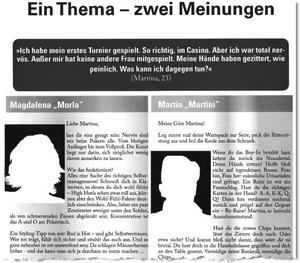 While Katja is certainly looking better than “Magdalena” one might argue that “Martin” is looking better than me 😀 – I think they should keep those “writers” and see how things go in the future. Other news: Sebastian and me are organicing the “Real German Poker Championship” in 2007 again, this time with a $1000 buyin and 32 players only. Will be an interesting event. See www.pokerstarsblog.de for details. I will play in Bregenz and EPT Dortmund in March, I got seats for both events. Katja is in London this week, doing some DSF-TV stuff. For you loyal readers asking if I am fine and for more posts: thank you very much, yes, I’m perfect. This is a busy time in my life but I will not forget this blog, even if I am not updateing to often right now. Thanks for coming here.